According to the findings of a study by the University of California, Irwin Medical Center, hip and knee replacement surgeries are on the rise owing to incrementing percentage of geriatrics and the mounting obesity rates in the US. Furthermore, the institute estimates that by 2030, the total number of knee replacements performed in the US will escalate by a whopping 600% as compared to that in 2005. 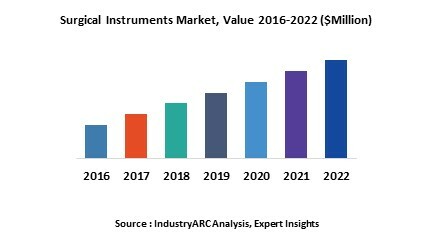 Subsequently, there will be an upsurge in demand for the instruments needed for those surgeries, which will significantly stroke the prospects in the global surgical instruments market, which had a value of $10.2 billion to $11.5 in 2018. Furthermore, opportunities in the surgical instruments market will be mounting at healthy CAGR of 6% to 6.5% during the forecast period of 2019 to 2025. Apparently, the developed economy, growing awareness among the citizens, broad spectrum of patients, and the availability of multifunctional products owing to the world-class healthcare facilities in the North American countries are booming the surgical instruments market in the region. Conspicuously, the deep-pocket investors in the region find the healthcare sector as a compelling investment, which includes the investment in surgical instruments. This largely supports the surgical instruments market in North America, and according to the findings by the market analyst, the region held the maximum share of 39% to 43% in 2018. Surgical instruments are devices like scalpel and hemostat that perform functions pertaining to surgery by a surgical technologist that includes modifying a biological tissue. There are many types of surgical instruments ranging from clamps and occluders for blood vessels, retractors for skin and ribs, and stereotactic devices. The major surgical instruments marketplace are private and government hospitals where they are used to perform diverse kind of surgeries. Their application is segmented on the basis of the type of surgical instruments that include surgical sutures and staplers, handheld surgical devices, and electrosurgical devices. The key market application segment is in the surgical suture and staplers, which will grow with a CAGR of 35% to 37% through to 2025. “The palpable rise in diseases such as obesity, cancer, and cardiovascular conditions coupled with the technological advancements and innovations in the healthcare sector to provide faster recoveries to the patients will catapult the demand for surgical sutures and staplers in the surgical instruments market,” highlights the market analyst in the report. According to a 2018 press release by the World Health Organization (WHO), 1.35 million die each year due to road traffic incidents. Furthermore, between 20 million to as much as 50 million people suffer from non-fatal injuries due to road accidents. The victims of car accidents can experience herniated discs and spinal cord damage. Evidently, these fatalities lead to other internal injuries too that entail surgery and sometimes replacement of body parts for complete healing. Even though these disquieting figures are causing concerns in the world, there is a myriad of opportunities for the vendors in the surgical instruments market because of the same. In 2017, there were 962 million people aged 60 years or over in the world which comprised of the 13% of the world’s population, according to the United Nations. The organization has estimated that the figure may rise to as much as 1.4 billion aged people across the globe in 2030. Apparently, these people suffer from a gamut of geriatric conditions, some of which warrant surgeries to be performed. This rise in the population of geriatric population and the complications pertaining to their surgery is also a major concern in the healthcare sector which is creating a dire need for innovation in the surgical instruments market. This is not only leading to new developments in the surgical instruments market but also creating a sustainable marketplace for the vendors. Even though there are other modes of treatment such as anti-inflammatory medications and cell therapy. However, owing to the fact that these treatment medical procedures are time-consuming, patients show a tangible predilection for surgery that leads to quick healing. This is quite evident when Basic Life Support estimates that the requirement for physicians and surgeons will be 13% times more in 2026 than in 2016 , which says volumes about the future prospects in the surgical instruments market. Latest Development – Recently, Zimmer Biomet innovated its product strategies and invented surgical equipment that can be used in orthopedic surgery as a tool for drilling, reaming, and sawing with lithium battery technology. This surgical equipment is going to dominate the surgical instruments market as it provides more precision and reliability needed for critical surgeries. According to the U.S. Food & Drug Administration, the computer-assisted surgical systems that can be utilized for surgical navigation and pre-operative planning are poised to bring a revolution in the surgical instruments market. The major challenge in front of the vendors connected to the value chain of the surgical instruments market is that there are many regulations regarding surgeries, and the geriatric population is more vulnerable to the negative ramifications of such operations. Subsequently, there is an incessant insistence by the government bodies towards safe surgeries which is creating a demand for safer surgical instruments. Moreover, the market size of surgical instruments is dwarfed by the reluctance shown by the target customers in the under-developed and the developing economies because of the affordability factor. However, the significant rise in demand from the developed countries coupled with the worldwide awareness about the importance of surgeries are factors that will keep flourishing the surgical instruments market. The key players striving to capitalize on the demand influx in the surgical instruments market are Medtronic Plc., Stryker Corporation, Johnsons & Johnsons, Conmed Corporation, Alcon Laboratories Inc., Smith & Nephew Plc, Zimmer Holdings Inc., and Boston Scientific. The base year of the study is 2018, with forecast done up to 2025. The study presents a thorough analysis of the competitive landscape, taking into account the market shares of the leading companies. It also provides information on unit shipments. These provide the key market participants with the necessary business intelligence and help them understand the future of the surgical instruments market. The assessment includes the forecast, an overview of the competitive structure, the market shares of the competitors, as well as the market trends, market demands, market drivers, market challenges, and product analysis. The market drivers and restraints have been assessed to fathom their impact over the forecast period. This report further identifies the key opportunities for growth while also detailing the key challenges and possible threats. The key areas of focus include the types of surgical instruments market, and their specific applications in cardiothoracic and others. The report analyses the product demands by the type of surgical instruments that include open surgery and minimally invasive surgery. It also has details about the market of handheld instruments and others. Is the market demand for surgical instruments growing? How long will it continue to grow and at what rate? What is our Vision 2030 for surgical instruments market? 16.11. Zimmer Biomet Holdings, Inc.